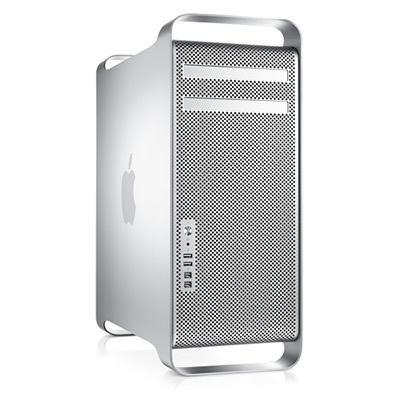 The Apple Mac Pro Twelve Core 2.66GHz Mid-2012 is powered by two Intel Xeon 6-Core 32-nm E5650 Westmere processors with 12 MB of L3 cache, Turbo Boost performance to 3.06GHz and Hyper-Threading that allows up to 24 virtual cores. It includes 16 GB of 1333 MHz DDR3 PC3-10600 ECC memory, a 1 TB 7200-RPM SATA hard drive, a DL DVD SuperDrive and an ATI Radeon HD 5770 graphics card with 1 GB of GDDR5 memory that can support up to three Apple 30 inch displays at resolutions of 2560x1600. This Apple OEM Mac Pro 12 Core is in full working order and good used condition with marks from previous use. It comes with your choice of OS X installed and a power-cord.